When I saw Cousins of Clouds: Elephant Poems on the new books shelf at the library, I snatched it right up. The cover artwork is gorgeous, and I almost immediately recognized the name of the poet whose works are contained therein. I read Tracie Vaughn Zimmer’s novel-in-verse Reaching for Sun (linked to my review) way back in 2008, but it has stayed with me, which is a sure sign of the talent of this poet-author. will notice his shadowed form. Isn’t the juxtaposition of the ancient and the modern nice? And I love the image of the metronome of a tail. 🙂 Each poem is accompanied by an explanatory note so that the context of the poem is made clear. Since some of the poems are about cultures or landscapes that might be unfamiliar to the reader or listener, this is very helpful. As wonderful as the poetry is in this collection, the other part of the equation here is the fabulous artwork by Megan Halsey and Sean Addy. The illustrations are mixed media collages, one of my favorite forms of art. From endpaper to endpaper, every page in this book is lovely. My favorite illustration is one which accompanies six separate haiku poems about the parts of an elephant’s body. There’s one entitled “Accessory” about the elephant’s tail, which the poet calls a “tapered rope of tail” and “a fancy tassel”; the artists, of course, illustrated the tail as a rope. The legs are called “great pillars” and “an architect’s dream,” so one leg is illustrated as a column. This two-page spread of the book is marvelous. You can see a little video clip of illustrations from the book here on the author’s website. Really, I could go on and on. I am definitely nominating this book for the poetry category of the Cybils this year, if someone doesn’t beat me to it! This would make a fantastic addition to a study of elephants (of course!) or even if you’re just looking to enjoy different forms of poetry, since this book contains quite a few. Highly Recommended! I’m really enjoying sharing poetry with my girls this month. In fact, I’m thinking that it should be something that we don’t wait until next April to do again in such concentrated doses! For more Poetry Friday posts this week, visit Random Noodling. 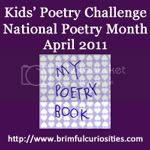 For more Kids’ Poetry Challenge posts, visit Brimful Curiosities. I think I will have seen everything, when I see an elephant fly. 🙂 I was able to read “The Cousins of Clouds” using the Amazon book viewer, and now I know why they can’t fly! Your patchwork elephants remind me a little of the Elmer book character. What a wonderful idea to change out artwork in permanent frames. As far as drawing, we keep markers, crayons and paper out at all times in our home so that the kids always have access and can create when the mood strikes. This book is right up my alley, combining as it does some of my fave things: elephants, flying, imaginative artwork, and intriguing poetry and poetry-topics. I have it in my Amazon shopping cart already. Your elephant collages are truly folk art. Thanks for your post today, Amy. I also have a child who hates to color and draw and groans at the mention of art. My other one, of course, loves anything arty or crafty. I think like a lot of things in homeschooling this gets to the balance between encouraging kids out of their comfort zone and enjoying the benefit of being able to play to their strengths. Yes, my girls have ready access to all sorts of art materials, too. This child loves to make things but doesn’t like to draw or color at all. I think it’s just “how she’s turned,” to borrow a phrase from some old timers I know. It sounds like your son and my daughter are a lot alike! We haven’t used an official art curriculum this year, but I’m planning to add one next year. What have you used? You daughters did a great job! I have a few hesitant artists in my classes. For these reluctant artists, I take a back seat when giving instructions. I allow them to interpret the lesson as they see it. I also don’t make a point of offering praise (sounds strange, I know!) but I find these kids are a tad more intuitive than most. But having said that, some kids don’t like drawing because they have compared themselves to others and don’t think they draw as well. Sometimes, a directed line drawing can’t boost confidence. Good luck! You’re doing great! Thanks so much for stopping by, Patty! Thanks for the encouragement, too. Cousins of Clouds sounds like such a good book! I will definitely have to see if I can borrow it from the library. My daughters are both very inclined towards arts and crafts projects, but I do have one daughter who REALLY doesn’t like to have any prescribed activities associated with her creativity, so I can identify with that! I absolutely love this post! I’m always excited about families who are sharing poetry. Thanks for submitting to the Carnival of Homeschooling. THANK YOU so much for sharing this book with your children and blog readers, I SO appreciate it! And, I LOVE the ellie art you all made. Gorgeous! Fantastic! Such a creative idea. Would love to share, may I? Ms. Zimmer–Absolutely! I would be honored to have you share our artwork! Your review of Cousins of Clouds has me itching to find it already! And your elephants are adorable. I wouldn’t call my son a reluctant draw-er, but sometimes lacking in precision or patience. One thing that helped – scented markers that he’s only “allowed” to use for “special” projects. Makes them somehow more desirable.